Fri 07.12.2018Elections of the DeanTwo candidates: prof. Pavel Matějka and prof. Michal Přibyl. Wed 18.03.2015Erasmus AfternoonAre you in Erasmus+? Meet friends in the Resperium on 18. 3. 2015 from 11 a. m.
Thur 26.02.2015Apply for a Ph.D.!Apply for a postgraduate study at our Faculty of Chemical Engineering! Thur 05.02.2015Siemens Award for Marek Lanč and Karel FriessMarek Lanč and his supervisor Karel Friess were awarded for Marek's Diploma thesis. Mon 02.02.2015New DeanProf. Marie Urbanová has been named as the new dean of the Faculty of Chemical Engineering. Thur 01.01.2015ICT Prague now UCT PragueFrom 1st of January we are using the name "University of Chemistry and Technology, Prague " (instead of Institute of Chemical Technology, Prague). Fri 12.12.2014New web pagesToday our Faculty of Chemical Engineering starts to use new web pages! On Friday the 14th of December 2018 at 1 PM in the AII lecture hall there will be a public presentation of both candidates in Czech language. The candidates will present their visions and will answer further questions of the academia members. The election will take place on the 17th of December and the new dean’s mandate will start on the 1st of February 2019. “Guanidinium salts are widely used as protein denaturants. In this work, we showed that their influence on biomacromolecules depended strongly upon the identity of the specific anion with which the guanidinium cation was paired. This led to very rich chemistry. For example, low concentrations of GndSCN helped to stabilize the collapsed state of the macromolecule despite the fact that higher concentrations of the same salt served as a powerful denaturant. Moreover, Gnd2SO4 worked as a stabilizer of protein structure, but for very different mechanistic reasons than low concentrations of GndSCN. The development department of ZENTIVA is proud to announce that Tereza Boleslavská, as the first Zentiva student, has just started two-month training at the Trinity College in Dublin within the frame of ORBIS (Open Research Biopharmaceutical Internships Support) program sponsored by 2.3 mio EUR grant from European Commission (HORIZON 2020). The aim of ORBIS is to create a bridge between academic and industrial scientists in order to develop new efficient methodologies in pharmaceutical RD. Zentiva will keep sending its best students and employees to study in the best European academic institutions. At the same time our academic partners will spend period of research work in Zentiva laboratories having the opportunity not only interact with our scientific staff but to gain experience from the pharmaceutical business and manufacturing as well. Schedule of Theoretical chemistry seminars (UCT & IOCB) for Spring 2018 is available. We have prepared a mixture of talks given by postdocs, local or domestic senior scientists and by distinguished speakers from abroad. Not only for UCT students, we have included three engineering oriented lectures. ATHENS interdisciplinary course on “DIGITAL SIGNAL AND IMAGE PROCESSING WITH APPLICATIONS” organized by Department of Computing and Control Engineering, UCT Prague, took place on November 14-18, 2016. All its participants from 7 countries successfully presented their research topics during the final colloquium. Laboratory of Inorganic Materials, a joint workplace of the University of Chemistry and Technology Prague and the IRSM ASCR, v.v.i., was awarded a two-year contract to work with US national Laboratories on the development of the mathematical model of glass melting during the vitrification of nuclear waste. The team at UCT Prague is headed by Richard Pokorny, a PhD student at the Department of Chemical Engineering, who already cooperated with US laboratories for several years. “Together with associated professor Jaroslav Klouzek, we will build on my previous work, and will focus on the development of the model for batch to glass conversion in nuclear waste melter. Using this model, we will be able to predict the melting rate, and help to optimize the whole conversion process”, Mr. Pokorny says. In southeastern Washington state, Bechtel National, Inc. is designing, constructing, and commissioning the world’s largest radioactive waste treatment plant for the U.S. Department of Energy (DOE). When complete, the Hanford Tank Waste Treatment and Immobilization Plant, also known as the Vit Plant, will process and stabilize million gallons of radioactive and chemical waste currently stored at the Hanford Site. For more information, visit http://www.hanfordvitplant.com/about-project. Professor Petr Slavíček from the Department of Physical Chemistry was awarded the Neuron prize for a young researcher. Congratulations!! The Neuron Award for Promising Young Scientists is designated to acknowledge Czech scientists under the age of 40, who have achieved excellent scientific results, and to recognise their activities and promote their future progress. Each year, the best scientists in the fields: physics, chemistry, mathematics, medicine and social sciences are awarded. Student Jakub Kubečka from the group of Prof. Slavíček received the Audience Award. Congratulations! Further finalist from our faculty was To Quyen Nguyenová from the Department of Chemical Engineering. Václav Bystrianský from the Faculty of Environmental Technology won the Academy of Sciences Award. Congratulations! Eliška Selinger from Charles University will represent the Czech Republic in the final international competition. FameLab is an international science communication competition that currently runs in 23 countries all around the world. Contestants have three minutes to present a scientific subject of their choosing. They are not allowed to use a projector. The only props allowed are ones that they can carry onto and from the stage themselves. got E-MRS award for graduate students conducting research. Congratulations! The Czech Constitutional Court recently referred to Prof. RNDr. Štěpán Urban's research into human smell recognition. Our student Vít Svoboda and his supervisor Ondřej Votava from the Department of Physical Chemistry received Werner von Siemens awards for their work "High resolution overtone spectroscopy of atmospherically relevant molecules". Congratulations! Werner von Siemens awards are sponsored by the Czech Ministry of Education, Youth, and Sports and the Ministry of Industry and Trade. 2016 marks the eighteenth time the awards have been granted. Traditional Students' Scientific Conference took place on Friday November 20, 2015. 141 of works in 18 competitive sections were presented by students of bachelor's and master's degree. The level of the lectures was high and the members of the commissions did not have an easy task to choose just the top three. Winners took diplomas from the hands of our dean prof. Urbanová. We congratulate to all of the winners! All organizers and participants are acknowledged! And of course we would like to thank our sponsors for their generous donations! Professor Miloš Marek from the Department of Chemical Engineering received the award for the outstanding outcomes of his research. He and his group focus namely on heterogeneous catalysts for exhaust gas conversion. On November 9-10, Jan Heyda from FCHE attended a rector’s conference of universities for the Danube region and Central Europe at the Danube University Krems. At this conference, young scientists—one from each of the participating states—received awards. The award seeks to encourage young scientists to engage themselves in the scientific examination of the multifaceted issues and questions specifically related to the Danube and to stimulate the specific community in the Danube Region. Universities, Academies of Sciences and research institutions in all 14 countries of the Danube Region have been encouraged to nominate suitable and promising candidates that have been assessed by an international expert jury. The highest ranked candidate of each of the countries that submitted eligible nominations will now be awarded with the prize. Dr. Jan Heyda, born June 18th, 1983, is a theoretical physical chemist, experienced in atomistic computer simulations, development of coarse-grained models, and applications of statistical thermodynamics. His fields of research are soft matter and aqueous solutions; in particular, ion- and cosolvent-specific effects and the control of biomolecular stability. During his PhD and postdoctoral research, he made a step from qualitative characterization of weak ion-specific effects to their thermodynamics description. Dr. Heyda is co-author of 37 publications in peer-reviewed journals, with more than 600 citations and h-index of 17. He holds several awards. The University of Chemistry and Technology Prague was one of organizers of the INTERNATIONAL WORKSHOP ON COMPUTATIONAL INTELLIGENCE FOR MULTIMEDIA UNDERSTANDING (IWCIM 2015) at the Strahov Monastery 29-30 October 2015. There were presented 41 papers submitted by 145 authors from 16 countries. Further details and complete videorecords of 4 invited lectures presented by authors from top universities are available from the workshop web page: http://iwcim.isep.fr/. All papers will be published in the IEEE Xplore. Are you in Erasmus+? Would you like to share your experiences with Czech students who would like to go abroad, provide some advice, cook food from home, and just have fun? Learn more. If you answered yes to any of these questions, join us and students from across the Czech Republic and from many other countries in the Resperium on Wednesday, 18.3. 2015 from 11:00-15:00, and see if Erasmus+ is right for you. 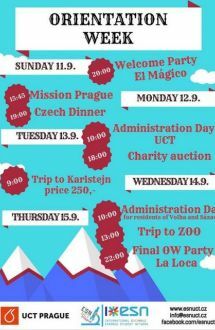 ESN UCT Prague members and international students will be on hand to personally answer your questions while you try new foods. You can also practice your language skills while voting for the best booth. UCT Prague's International Relations team will able be available to answer your questions about exchange programmes and work placements. The Faculty accepts PhD students on a rolling basis throughout the calendar year; it is essential when making your application for doctoral studies that you find an advisor who will guide you through the entire period of your PhD studies. Marek Lanč and his supervisor Karel Friess were awarded for Marek's Diploma thesis "Study of gas transport in high free volume polymers" by Siemens. The Werner von Siemens award was associated with a financial reward and the memorial medal of Werner von Siemens. New DeanProf. Marie Urbanová has been named as the new dean of the Faculty of Chemical Engineering. Today our Faculty of Chemical Engineering starts to use new web pages!